Yet, Easter Sunday is actually just the first day of the Easter Octave, the eight-day festal period in which we continue to celebrate the momentous conclusion to the Paschal mystery and the economy of salvation played out in liturgical time. The eight days of the Easter Octave are a special time to celebrate the Lord’s Resurrection and more deeply contemplate its mysteries. The Church punctuates the special importance of this feast by assigning it the highest liturgical ranking, that is, as a Privileged Octave of the First Order. This means each of the eight days is counted as a solemnity, the highest-ranking feast day, in which no other feast can be celebrated. It begins the fifty days of the Easter celebration to the feast of Pentecost, but these first eight days of the Easter Octave culminates with the second Sunday of Easter: Divine Mercy Sunday. It is entirely fitting that Divine Mercy Sunday is the culmination of the Easter Octave, for as St. Pope John Paul II stated in his Divine Mercy Sunday homily in 2001, “Divine Mercy! This is the Easter gift that the Church receives from the risen Christ and offers to humanity.” Divine mercy is the grace and merit won by Christ on our behalf in His Passion and Resurrection. The grace of Easter naturally flows into Mercy Sunday. Even before the official designation, the Church has historically designated these eight days of Easter to celebrate the Paschal mysteries of divine mercy. The early Church celebrated the Sunday after Easter as the feast day, Dominica in Albis depositis, “the Sunday dressed in white linen.” St. Augustine is attributed to have called it “the compendium of the days of mercy.” Indeed, in his Regina Caeli address on Divine Mercy Sunday on April 26, 1995, Pope John Paul II said “The whole Octave of Easter is like a single day,” and that Octave is “thanksgiving for the goodness God has shown man in the whole Easter mystery.” In these eight feast days, we offer thanksgiving for the divine mercy and salvation wrought for us on Good Friday and Easter Sunday. It is fitting that Divine Mercy is a continuation of Easter because of its inherently Paschal and Eucharistic imagery. 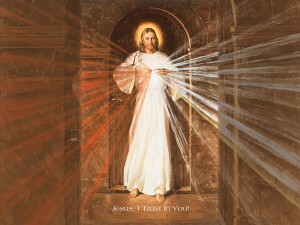 In the Divine Mercy image, Jesus is pictured with two rays of light coming from His heart, one red and one white. These depict the blood and water, which flowed forth from His heart after He was pierced by a lance on the Cross. The red ray of light reminds us of the blood of the Cross, and the blood of the Eucharist; whereas, the white ray of light reminds us of the waters that flowed from His pierced side, and the waters of Baptism, and the gift of the Holy Spirit. The image embodies the Paschal and Eucharistic mysteries. Therefore, we continue to celebrate the Paschal and Eucharistic mysteries in these eight days of Easter, culminating the Easter Octave of Divine Mercy Sunday. Christ has promised us great mercies if we observe the Feast of Divine Mercy. As Jesus told St. Faustina, “I want to grant a complete pardon to the souls that will go to Confession and receive Holy Communion on the feast of My mercy.” This is a particularly great indulgence promised by Jesus for the complete remission of our sins and punishment. So, as we celebrate Easter, let us recall the spark that came from Poland with Sts. Faustina and Pope John Paul II, and put mercy into action by dedicating ourselves to the devotions associated with its message: the image of Divine Mercy, the Chaplet of Divine Mercy, the Novena of Divine Mercy, and the Sunday of Divine Mercy. Easter Sunday is not the end of the Church’s celebration. It is the beginning of the full Octave of Easter. Let us celebrate all eight days of this feast, all the way to Divine Mercy Sunday. How fitting it is, especially this Jubilee year, the Holy Year of Mercy. Brian Kranick is a freelance writer focusing on all things Catholic. He has a master's degree, among others, in Systematic Theology from Christendom College. For the past decade he has lived and worked in the Washington, D.C. area as an analyst in the Intelligence Community. He currently resides with his wife and three daughters in the Pacific Northwest where they enjoy their faith community and the great outdoors. He is the author of the new blog sacramentallife.com.